Tohle bylo zase tak milý! JSK je ukázkový kočičí "případ". Vypráví krásně a její rady do života vás inspirují. Kniha, která zahřeje jako teplá deka za zimních večerů. I love this this series, book 2 is even better then the first. I love that the cat narrates the book and if you're not a cat lover lots of dogs appear. There is a shocking revelation (view spoiler)[HHC was reincarnated from a DOG (hide spoiler)]Highly recommended for anyone who loves animals, wants a break from violence and despair! David Michie has found a whimsical, clever way to educate the reader about happiness from a Tibetan Buddhist perspective. Although I didn't initially choose the book with a goal to learn more about Tibetan Buddhism, I learned a lot. And despite learning a lot, it was an easy, enjoyable read. I enjoyed the human and animal characters and became eager to see where their narratives led.It is written in the first person perspective of (as the title says) the Dalai Lama's cat, and I grew very fond of HHC (His Holiness's Cat), one of the names by which she is known. The story takes place over several weeks while the Dalai Lama is away. He has given HHC the "assignment" of, in his absence, discovering the secrets to true happiness, and we get to go along for the ride. As she learns, so does the reader. It really is cleverly done.Although this book is a sequel to The Dalai Lama's Cat, I thoroughly enjoyed it as a stand-alone. I have not read The Dalai Lama's Cat, but I now plan to. I hope this is a series and that there will be more than two.Bravo to an unexpectedly profound, delightful read! *NOTE: This is a review of the entire trilogy. *I love reading books about cats. If I could read nothing but books about cats, I probably would, and be happy while doing it. I love learning everything I can about them. I also love learning about religions that I haven't studied yet. When I heard about The Dalai Lama's Cat trilogy, it sounded like the perfect book trilogy for me. I'm so glad that I picked it up. I loved the trilogy so much that I ended up reading all three books in a twenty-four hour time span.When I started the first book in the trilogy, I wasn't entirely sure what to expect. I thought I would get a few cute stories about HHC (His Holiness' Cat) that would make me chuckle. However, this trilogy was so much more than that. Yes, there were great about HHC that made me laugh so hard, especially the one about drinking the reporter's water. There were also times where the book made me sad, like when a certain main character dies out of nowhere, and I find myself sobbing. The book made me feel so many different emotions that a book hadn't made me feel in such a long time.The Dalai Lama's Cat trilogy also taught me several different things. I didn't know much about Buddhism before reading this book. Now, it's definitely a religion I want to research more. I love the idea of finding inner peace by thinking of others, instead of thinking of yourself all the time. I've tried to practice that ever since I finished the book, and it actually does work. It makes me feel a lot calmer. The trilogy also made me want to do some research on The Dalai Lama. I was curious if he actually had a cat, so I googled it, and went from there. I found out that he has wrote a few books, and placed a hold on them from the library right away.I loved everything about The Dalai Lama's Cat trilogy. Going into the book, I wasn't sure what to expect, but I was pleasantly surprised by what I got. I loved the stories about HHC, and loved learning more about Buddhism. This trilogy has inspired me to live in a way that is kinder to others, and brings inner peace. I can't wait to read more books about Buddhism, and The Dalai Lama. I recommend this trilogy to anyone looking for a captivating tale with great lessons attached on how to live in a peaceful environment. Sometimes when you read a book which touches you, gives you a laugh and just plain makes you feel good, reading a sequel can be a bit daunting.I approached The Dalai Lama’s Cat and the Art of Purring with a certain degree of trepidation because, Starts at Sixty members will remember, I so thoroughly enjoyed HHC’s previous literary triumph. I needn’t have worried, HHC is no one hit wonder Since reading HHC’s first book, The Dalai Lama’s Cat, I’ve recommended it many times and a number of people have come back to say how much they enjoyed their insight into a new world. Particularly heartening was the seriously ill lady who told me reading this book had made her feel calm, so much so she even decided to invite a Himalayan cat into her life! It is not necessary to have read the first book to enjoy the second, they stand alone, but to read them in order is to rediscover old friends not just meet new ones.HHC is of course His Holiness’s Cat, the beautiful lady also known as Rinpoche, The Most Beautiful Creature that Ever Lived and Snow Lion who shares her home with His Holiness the Dalai Lama. I am a cat person and have shared my life with many beautiful enlightened ones making me predisposed to love HHC. For our dog loving friends however, there is much for you to enjoy because cats, dogs and people are sentient beings and there are a number of dogs who also inhabit HHC world. In fact HHC herself dreams of a time when … oops, can’t say anymore!In this second insight to the life of Rinpoche (meaning Precious) she is faced with losing His Holiness to the world for 7 long weeks. Before he leaves, the Dalai Lama asks her to think about happiness and what makes her purr. We travel this road with her whilst she observes not only her own feelings and reactions, but also the lives and emotions of those close to her world. It actually took more time to read than the number of pages would indicate because I found myself examining my reactions to what I was reading. With all due respect to HHC, her transcriber and the Dalai Lama, if someone offered me a book on Tibetan Buddhism to read, I admit I would probably politely decline or find many excuses for leaving it on the bookshelf. I’d tell them I’m not into “all that”; yet I am definitely into “all that” as espoused in a novel. There is no hint of evangelizing (is that word appropriate in relation to Buddhism?) in The Dalai Lama’s Cat and the Art of Purring yet the messages are clearly conveyed. I related to so many of the teachings such as “Exchanging thoughts of self for thoughts of others – this is the most effective way to be happy” and the balance provided by “Be wisely selfish little Snow Lion. Gain happiness for yourself by giving it to others.” In an article about Volunteering I was trying to convey why people volunteer and the good they accomplish – these words above would have been perfect. See what I mean? The quotes are not meant as a sermon yet they are relevant to life, so that I learn about myself despite myself! Thank you to Hay House via Netgalley for my copy of this enjoyable, humourous thoroughly entertaining read. When will HHC be ready to publish her next book? I read and thoroughly enjoyed David Michie's first novel, "The Dalai Lama's Cat," so I was delighted at the opportunity to read the next outing featuring HHC (His Holiness' Cat) and her perspective on life at McLeod Ganj.This time, His Holiness is going away for an extended period of time and asks the cat to consider why she purrs. This begins HHC's examination of happiness. She learns several lessons through the course of the book just by observing what happens in her circle of human and canine friends around town.Michie's clever way of teaching Buddhist precepts without preaching, as the lessons are seen through the eyes of a charming and lovable HImalayan cat, is a great way to introduce concepts about living in the present, meditation, and understanding that material objects and success are not really the basis for happiness.I may re-read this book tomorrow; that's how much I enjoyed it. A wonderful sequel to a marvelous book, this does not disappoint. If anything, this reader was left wishing for more. Not a fan of books from the animal's perspective, author David Michie pulls it off with aplomb. Highly recommended. This book and its prequel will easily transport you to another country, way of life and a basic understanding of Buddhism. I loved this book even more than it predecessor. The story is as fluid and the characters as charming as in the previous book, but there is a certain depth of teaching, under the guise of the easiness with which the Author get's the Cat to tell the story. I loved it and certainly recommend it as a good read!Maria Carmo,Lisbon, 26 October 2015. This is the second book in the series and it is just as wonderful as the first. A well written book. Good blend of adaptive philosophies that are relevant to all. The final pages though are a bit dramatic . The narrative style is interesting and should keep you wanting for more. It is difficult to write a review of what happens in this delightful book without adding spoilers and that is something I am not going to do! Suffice it to say that I had to get a copy as soon as it became available in the UK! I was a little concerned how a sequel would stand up because very often the original inspiration is so much better. In this case I was not disappointed. In a way, I found this a more thoughtful book than the first but I dearly love them both. The Snow Lion is very close to my heart (having been owned by one of my own) so it is almost as if these books are meant for me. 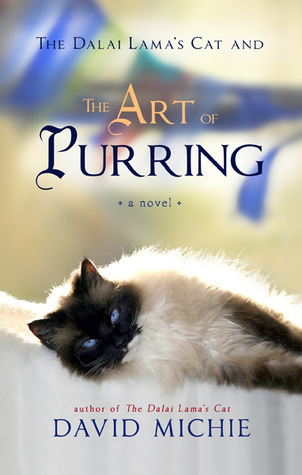 :) I know I shall be reading The Art of Purring again and again - just like The Dalai Lama's Cat - because there is much more to it than just a simple cat story and it takes time to absorb it all. This is a book that those drawn to Buddhism and cat lovers alike will enjoy.The simple premise is that the Dalai Lama goes away for 45 days on business and sets HHC the task of finding out "What makes you purr?" During the course of the book HHC learns much about the art of purring from the human beings (and the animals) around her. At the end, the Snow Lion makes a surprising and disturbing discovery about a past life that gives her real food for thought! Not telling.... you have to read it for yourself! As happiness is something all beings desire, this book is very helpful and Rinpoche's discoveries about happiness will be pertinent to all sentient beings! Highly recommended for all fans of the Snow Lion and those who would like to meet her. This is the 2nd book in what is to be a trilogy, about the observations of the Dalai Lama's cat as she listens to the different characters in the book, from the Dalai Lama to his staff to her friends at her favorite cafe and Yoga studio, the Dalai Lama sets for his lovable feline companion the task of investigating The Art of Purring, or in other words (Happiness). These books are a simple read, packed with a lot of great wisdom, which makes them very enjoyable to read. We can connect to the characters and the struggles they are going through, and find solution to not only their problems but maybe ours as well., and we will be able to see and understand how elements of contemporary science and Buddhism converge. I cannot wait for June to be able to read the last book in the trilogy, and find out what is in store for not only the cat but the characters we have been following. I started the series with this the 2nd book, but it makes no difference to understanding or enjoyment.This is a delightfully written book, with a simple writing style that belies the fundamental wisdom of its message. I've been reading this while moving home and it's message about not letting little issues upset you particularly helped me at this time. This is probably an enduring lesson for me as well in day to day life and I love the way the lessons were presented and then recapped towards the end of this quick read.I would summarise by saying its Buddhist philosophy for the layman, written in an easy enjoyable style through the eyes of a cat; entertaining and unique. So happy to be able to spend some more time with Rinpoche aka Snow Lion aka HHC plus several other names. I hope there will be even more books in this series! I enjoyed catching up with many of the characters from the first book, The Dalai Lama's Cat, and meeting some new ones. Reading these books is almost a guilty pleasure--I enjoy them so much it doesn't really feel "spiritual," even though the content is there for the taking. Obviously, I absolutely love this book. I love how the otherwise complicated-to-follow Buddhist tenets are explained in such simple words in this book. I love the anecdotal method of the flow in this book. And I totally totally love the parts where HHC is talking about HHH The Dalai Lama, such love, admiration and warmth it makes me feel. It made me purr. And reminded me, among many other things, that it is OK to stretch out and just take it easy in my favorite spot. A great read! You will be smiling all the way thru it. Cat BuddhismA cat whose adventures explain Buddhist principles and an enjoyable and easy read. It follows on from the first book with an easy grace. This book was a good as the first. I started #3 the minute I put #2 down! As lovely as the first book in this series! A light read with some less than light philosophies of life. An easy and fun way to touch on the topic of finding happiness. Although rather contrived (the cat winds up in all the right places, as cats seem to do) and somewhat dull, the story reaches some concise and helpful conclusions. It would be appropriate to introduce to children as well as adults. It introduces the concepts expressed in many religious philosophies, not just Buddhist. For Example, putting others before self, finding a cause greater than self, success stemming from happiness rather the opposite, regulating one's responses to events(equanimity) versus reacting, carpe diem (living in the moment rather than past or future). A lot to ponder, but a very calming book in its simplicity. My kids picked this one up from a church used book sale because it had a cat on the cover. The cat narrates the entire book, so they weren't disappointed. Most of the philosophical pieces went straight over their heads, and they had trouble keeping track of the different characters (probably because they stopped paying attention when it got too conceptually dense), but at 7 and 8 years old I didn't really have high expectations for their retention of this particular piece. The diction is very formal, as perhaps befits a feline companion of the Dalai Lama, but this creates unnecessary confusion in young minds who might prefer a, shall we say, less effusive narrator. I thought it was all right. It's the first book "about" Buddhism that I've actually finished, so that's saying something. "-Exista o intelepciune aparte cu privire la fericire, imi spuse Sfintia Sa. In unele texte este numita Secretul Sfant. Ca si intelepciunea din belsug, este simplu sa explici, dar nu atat de simplu sa o si traiesti. Secretul Sfant este acesta: daca vrei sa pui capat suferintei, cauta sa pui capat suferintelor altora. Daca vrei sa fii fericit, cauta ca si ceilalti sa fie fericiti. Schimband gandurile pe care le ai despre tine cu ganduri despre altii - aceasta este cea mai eficienta cale de a fi fericit." It was a very light, happy and amazing read. Learning from the feline experiences the great lessons of life. The simplicity of the book also introduces the reader to the simplicity of being happy. Success is not the cause of happiness but its actually otherwise. The first part was little fast read compared to this part. I found it quiet slow but few chapters , pages were really gripping it may be because i like books on mindfulness, consciousness.